Tony Blair has launched what he says is the biggest consultation exercise ever with voters. The prime minister went to Newport, Wales for the launch of a 77-page document setting out the challenges faced by Britain. Flanked by Chancellor Gordon Brown and Deputy Prime Minister John Prescott, Mr Blair said the government was at a "fork in the road" adding: "This is the time for the party to take risks". Critics of the idea have dismissed it as a New Labour "gimmick". 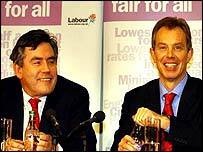 But Mr Blair said that after six and a half years in power, Labour had a choice: Go forward or "settle back". He added that the anchor to the consultation exercise was social justice, which he described as the "big idea". But he added that in the 21st century new "routes" were needed to attain it. In the foreword to the prospectus Mr Blair wrote: "It's time for a grown up discussion. "Big issues need real debate, a big conversation between politicians and the people." The "Big Conversation" includes a website aimed at giving people a chance to air their views on policies. Among the questions raised by the document is whether councils should have greater power to ban workplace smoking. It also asks if rowdy city centre pubs and clubs should have to contribute towards policing. Other issues include the future of funding in further education and UK membership of the single currency. The prospectus - entitled 'A Future Fair for All' asks: "How important is the euro to locking in macroeconomic stability?" It also lists Labour's record in government and summarises current policy areas that are under discussion. Voters are asked to e-mail or text their views - the latter costing 25p on top of the usual charges. Mr Blair, along with ministers and Labour MPs, MEPs, and councillors, has pledged to visit many parts of the UK in the coming months to discuss the issues. The event came as a YouGov poll for the Daily Telegraph suggested that Tory leader Michael Howard has moved his party ahead of Labour for the first time in a decade, with a two-point lead. Mr Blair said: "We must engage people about the choices needed. "At the end of the process, the nation will still have the democratic right to vote out the government and the Labour Party is still the Labour Party with the political right to have the view it has." But opponents to the prime minister have derided the scheme, suggesting ministers are not really prepared to listen and change tack. And a leading pollster, MORI's Bob Worcester, suggested that there was a danger of pressure groups hijacking the exercise to promote their causes rather than the concerns of individual citizens. How do we build on economic stability? How do we do more to tackle poverty and inequality? How do we lead healthier lives? How do we make our communities safe? How do we give every child an excellent education? How do we balance work and family life? How do we ensure security and well-being in older age? How do we provide a modern transport network? How do we create a fair asylum and immigration system that benefits Britain? How do we safeguard our environment for future generations? How do we do more to connect politics and people? How do we make Britain stronger in Europe? How do we develop our concept of international community? 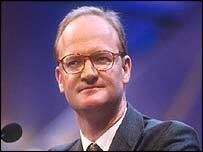 Conservative head of policy co-ordination David Willetts told BBC News Online he suspected the prime minister would not take any notice of people's opinions. "I hope he really does listen. The trouble is all the evidence is he won't. "After all, he's just announced this week that he's bringing in top-up fees and - that is not something students want, it's not something we want and it's not something many of his backbenchers want." Liberal Democrat chairman Matthew Taylor was also dismissive. "Labour has been ignoring people for years now, this simply makes it official," he said. "E-mail your views, but everyone knows that from foundation hospitals to war in Iraq and tuition fees, Labour doesn't listen." Labour backbencher Paul Flynn - whose constituency is in Newport - said the first line for consultation should be the party's MPs. "But there's been a feeling of resentment among many MPs that things like top-up fees or foundation hospitals did not come from any party or public consultation," he said. Labour officials say nothing will be off limits and Ann Black, elected to Labour's National Executive Committee by grassroots members, said issues like higher taxes for top earners should be considered. The move follows Wednesday's Queen's Speech, which laid out Mr Blair's agenda for the next parliamentary year. The "Big Conversation" website is already up and running. "Mr Blair wants to be seen to be listening"
What issue would you raise with Tony Blair?